This section covers a variety of ancillary topics plus a potted history of Rugby Football in the 19th century. After a goal is won the losing side shall kick off and goals shall be changed. When the ball is in touch the first player who touches it shall throw it from the point on the boundary line where it left the ground, in a direction at right angles with the boundary line and it shall not be in play until it has touched the ground. If a player makes a fair catch he shall be entitled to a free kick, provided he claims it by making a mark with his heel at once; ad in order to take such kick he may go as far back as he pleases, and no player on the opposite side shall advance beyond his mark until he has kicked. Neither tripping nor hacking shall be allowed and no player shall use his hands to hold or push his adversary. A player shall not throw the ball or pass it to another with his hands. No player shall take the ball from the ground with his hands while it is in play under any pretext whatever while it is in play. The full list of FA Cup finalists can be found here. failure to qualify for the final stages on three occasions. failure to qualify for the final stages of the competition on five occasions. Lurid tales, not necessarily believable, talk of the heads of defeated enemy or human skulls being used as balls in the earliest times. More reasonably, animal bladders, often pig’s bladders, came to be used. They could be filled with cork shavings or similar materials. These balls tended to be plum-shaped, not round. The bladders eventually came to be covered with leather for better shape retention. Charles Goodyear patented vulcanised rubber in 1836. This process gave the rubber strength, elasticity plus resistance to solvents and moderate amounts of heat and cold. He designed and made the first rubber based soccer ball in 1855. 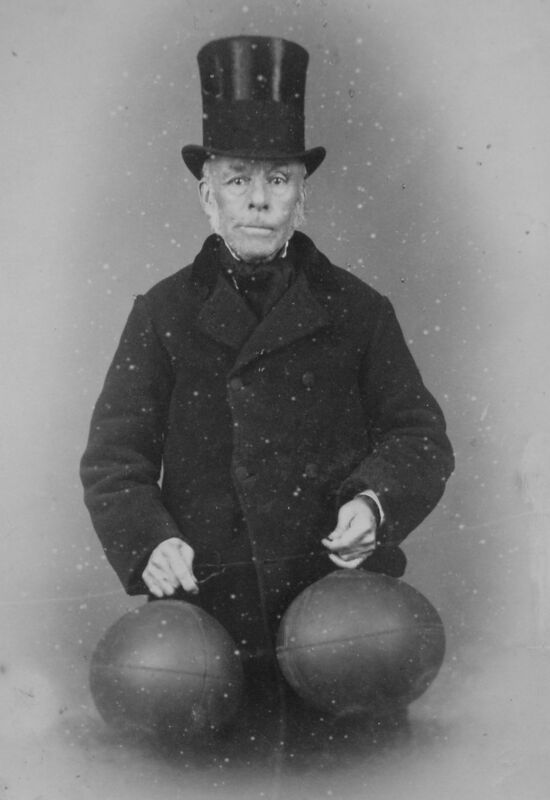 In England, Richard Lindon introduced the first inflatable rubber bladder in 1862. The 1863 association rules made no mention of the ball. It was 1872 before the rules were revised, dictating that the ball must be spherical and be 27 to 28 inches in circumference. Rugby was played with the same ball as association until 1870 when the introduction of rubber inner-tubes and the pliability of rubber produced a ball that was more egg-shaped. The RFU officially decided that ovalness was the compulsory shape for a rugby ball in 1892. See this history of the soccer ball for further information. 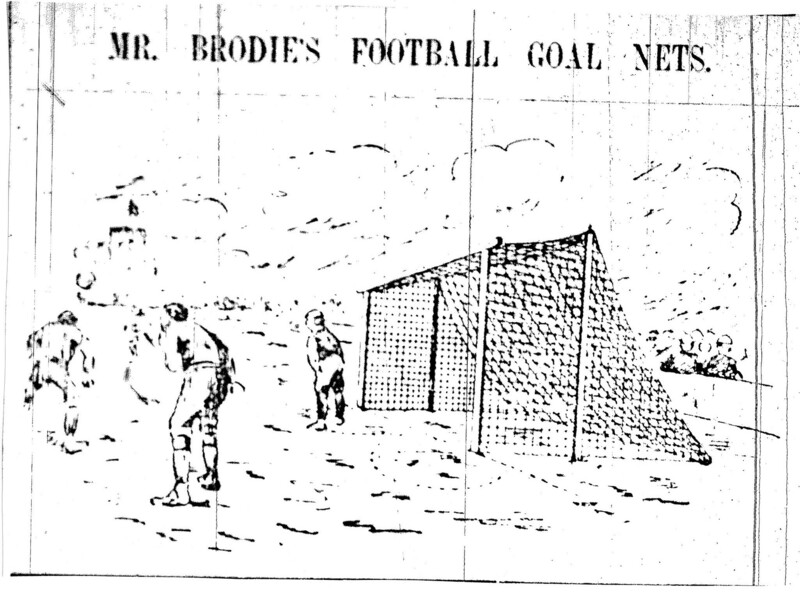 Goal nets were invented by John Brodie, a Liverpool engineer, who thought of the idea after witnessing a dispute over whether a goal had been scored at Everton’s match with Accrington Stanley in 1889. He applied for a patent in 1890 and Liverpool Ramblers tried the nets out for him. The first version included bells which would ring when the ball hit the net. The bells did not ring and were therefore dispensed with. The first official FA trial took place in a North versus South game at Nottingham in 1891. Nets were subsequently used in the 1892 FA Cup Final between West Bromwich Albion and Aston Villa, and became widespread thereafter. Pitch markings changed, as the laws were altered. The diagram below is taken from the 1905 Book of Football. It is also reproduced in the goalpostbooks.co.uk website. The original matchday football programme, usually called the match card, was typically a single piece of card which was limited to the date, time and venue of the match along with details of the expected line ups of the two teams. Early references to these cards include: England versus Scotland (1873), Eton versus Yale (1873), the 1882 FA Cup Final between Old Etonians and Blackburn Rovers, and Notts County versus Bolton Wanderers (1885). They became standard items with the advent of the Football League in 1888, usually with the addition of adverts. The first matchday programmes to resemble their modern day equivalents appeared around 1905 and 1906 with the Albion News (West Brom) and the Aston Villa News and Record. Programmes gradually became collectable items. Sought after programmes include: the first FA Cup Final at Wembley in 1923; Manchester United versus Sheffield Wednesday in February 1958 (United’s first game after the Munich air disaster); and the 1966 World Cup Final between England and West Germany. A fanzine is a magazine written by fans for fans. The initial fanzine was The Comet, a science fiction publication that first appeared in the USA in 1930. The genre spread to other activities, including football. Gunflash, the official publication of Arsenal Supporters Club, first appeared in 1949. However, some purists might argue that it is not a genuine fanzine, opining that it should be a fully independent mouthpiece for supporters. They would possibly regard Foul (1972-76) as the first football fanzine. Arguably, it was the 1980s when individual club fanzines really took off. They were accompanied from 1986 by When Saturday Comes, a zine that did not have a single club focus, which subsequently became a mainstream magazine. and YouTube first appeared in 2005, offering the ability to upload video content. This popular technology has been readily adopted by the clubs (for their official content) and by some fans (for their zines). Historically, five-a-side football has been the most popular form of the small sided game in England. There are a number of press references to competitions back in the 1880s, particularly in Lancashire. It seemed to be one of the activities that was offered in summer events such as general sports days and even horticultural shows. Games were presumably played outdoors. In the inter-war period five-a-side games became part of the overall training regime at football clubs. It is unclear when the indoor variant of five-a-side first appeared. References in the press can be found after World War II. The rules for the indoor game included: no touchlines (the use of rebound walls or boards); the ball is not to go above head height; and only the goalkeeper is allowed in the semi-circular penalty area. Competitions appeared in the 1950s, starting with the London five-a-side Championships for professional clubs in 1954 which was sponsored by The Evening Standard. Five-a-side games were subsequently played on artificial, floodlit pitches with cage surrounds when they appeared. Futsal is also played with five players on each team. It was invented in 1930 by Juan Carlos Ceriani, a teacher in Montevideo, Uruguay, and it was initially played on basketball courts. Hockey-sized goals are used; there are touchlines (no side walls or boards as in five-a-side); and a slightly smaller ball with less bounce is used. The game spread quickly across South America, and with FIFA’s guiding hand across the rest of the world from the 1980s. It is played in England although it is not as popular as five-a-side. The FA also recognises four-a-side, six-a-side and 7-a-side forms of the game. At my school we used to have an annual scratch eight competition. Each team consisted of a mixture of players from the lower, middle and upper schools. The pitch was in the playground and was very roughly the size of half a football pitch. Games were played at lunchtime. A North versus South dispute concerning payments to players. In the case of rugby this led to the formation of the Northern Union which eventually became the Rugby Football League. The various forms of football that were played at public schools in the late 18th and early 19th century typically included scrimmaging, later called scrummaging, handling and dribbling. Rugby was a school where scrimmaging was definitely the core element of the game. There was no limit on the number of players in a team, the majority of them taking part in the scrimmage. There could be 50 or 60 players in it. Players stood upright, not bent down as they are today, and they attempted to push the other side backwards and kick the ball forward in the scrimmage at the same time. When the ball eventually squirted out of the scrimmage, which could take several minutes, it was the responsibility of the backs to retrieve the ball and make as much ground as possible before setting up the next scrimmage .. and so on. Hacking, kicking an opponent below the knee, was a technique which was often employed in the scrimmage. It can be seen from the above description that there tended to be little handling or dribbling in the Rugby School version of football. The story of William Webb Ellis picking up the ball and running with it during a match in 1823, thus creating the rugby style of football, is largely regarded as being apocryphal. Three pupils at Rugby School codified its rules in 1845, the first school to do so. They were subsequently reviewed in 1848 and revised on a regular basis thereafter. I suggest that the mere existence of a single written set of rules made it likely that it would ultimately form the foundation for any future rules of the game. There were a couple of other sets of rules which appeared in the 1860s. Blackheath, famous for leaving the FA in 1863 because it disagreed with the initial set of association rules, had previously produced its own set of football rules in 1862, while Dublin University produced its own version in 1868, based heavily on that of Rugby School. Clubs which played a rugby style game started to appear around the same time as clubs who favoured a dribbling game. They included: Guy’s Hospital (1843), Liverpool (1857), Blackheath (1858), Manchester (1860), Sale (1861), Richmond (1861), Barnes (1862), Bath (1865), Harlequins (1866) and Wasps (1867). On December 4th 1870, Edwin Ash of Richmond and Benjamin Burns of Blackheath published a letter in The Times suggesting that “those who play the rugby-type game should meet to form a code of practice as various clubs play to rules which differ from others, which makes the game difficult to play”. On January 26th 1871, a meeting attended by representatives from 21 clubs was held in London at the Pall Mall restaurant. The clubs were Addison, Belsize Park, Blackheath, Civil Service, Clapham Rovers, Flamingoes, Gipsies, Guy’s Hospital, Harlequins, King’s College, Lausanne, The Law Club, Marlborough Nomads, Mohicans, Queen’s House, Ravenscourt Park, Richmond, St. Paul’s, Wellington College, West Kent and Wimbledon Hornets. Wasps were invited but reputedly turned up at the wrong place, on the wrong day and at the wrong time, and thus they unfortunately forfeited the right to be called a founder member. As a result of this meeting, the Rugby Football Union (RFU) was founded. Algernon Rutter was elected as the first president and Edwin Ash as treasurer. Three lawyers, who were all Rugby School alumni (Rutter, Holmes and L.J. Maton) were asked to draw up the first laws of the game, which were approved in June 1871. Although based on the rules of Rugby School, they removed its more violent elements, including hacking and tripping. The first international match between England and Scotland took place in Edinburgh in March 1871 before these laws had been approved. The two sides agreed to use the rules of Rugby School with a couple of minor changes. Scotland won the game. Although both rugby and association football took time to gain general acceptance, it was rugby that proved to be the more popular sport in the 1860s and 1870s. Soccer, with its eventual appeal to the working man, overtook it in the 1880s. In the early years of the RFU there were 20 players on each side, consisting of 17 forwards and 3 full backs. This was reduced to 15 players for the Varsity match between Oxford and Cambridge in 1875, and 15-a-side was subsequently generally adopted, the first 15-a-side international match taking place in 1877. Positions outside the scrum were the first to evolve. The three full backs were split with two of them moving closer to the scrum. They were initially called half-way backs, and subsequently half-backs. In Cardiff a tactic was developed of giving a short pass to one of the half-backs who would go charging at the opposition. He was called the flying half-back, eventually shortened to fly half. The introduction of tactics in the early 1880s, particularly with respect to passing, led to the realisation that players were required between the half backs and the full back, subsequently known as the three-quarters (half way between a half and a full!). There was initially a single centre with a wing on either side of him. Wales then introduced a second centre in 1885, largely by serendipity, when a replacement for an injured centre played so well that they did not wish to drop him for the next game. Therefore, they decided to accommodate both players, and so the three-quarter line as we know it today came into existence. There were no specialist forward positions in the early days of rugby. For example, the first players to arrive at a scrum would form the front row. In addition, there were various scrum formations .. 3-2-3, 3-3-2 and 3-4-1. New Zealand subsequently had a diamond 7 man formation (2-3-2) with the eighth man (a wing forward called the rover) who fed the scrum and protected the scrum half who was positioned at the base of the scrum. It was to be the 1920s before specialist forward positions appeared. Wavell Wakefield of England, a strong athletic player and an excellent strategist is credited with allocating specific roles to forwards, including the use of strong, fast back row players. Subsequently, the role of number 8 evolved in South Africa in the 1930s. The first international matches played by England include: Scotland (1871), Ireland (1875) and Wales (1881). The first official Home Nations set of matches took place in the 1880-1881 season although they were just friendly matches in the beginning. Forms of rugby spread across the British Empire from the 1860s. Dates of the eventual formation of official rugby unions include: New South Wales (1874), Queensland (1883), South Africa (1889), New Zealand (1892), Argentina (1899) and France (1919). The International Rugby Football Board (IRFB), nowadays called World Rugby, was formed on the back of a dispute between England and Scotland over a try scored by England in the 1884 match between the two countries. It centred on the interpretation of the knock-on rule. The dispute rumbled on, and Scotland, Wales and Ireland decided to form the IRFB in 1887, saying that it would decide on the laws of the game. England insisted that it was their game and their laws, and so refused to join. The IRFB countered by saying that no games could be played against England. The stalemate continued until 1890 when England eventually agreed to arbitration. They lost their case and joined the IRFB in 1890. England initially had six votes, while the other three countries each had two. Up to 1875 a game was decided by the number of goals that were scored. A goal could come from the conversion of a try, a penalty or a drop goal. Note that a try counted for nothing. It merely gave you the opportunity to (try to) score a goal with your conversion. From 1876 to 1885, tries were taken into account but only if the two sides were level on goals scored at the end of the game. A points system was eventually introduced in 1886 when a try was accorded a measly single point, a conversion two points and a penalty or a drop goal three points. A try was increased to two points in 1891 and subsequently to three points in 1894. The current allocation of five points for a try only appeared in 1992. It is interesting to note that the drop goal was the most valuable score from 1891 to 1947, being worth four points. Just as professionalism intruded into association football in the 1880s, so the subject of payments to players appeared in rugby football in the 1890s. Once again, it was northern clubs who were involved. Working men had started to play the game but, as with soccer, they found it difficult to participate without some financial help. Unlike soccer where gate money allowed the better players to be paid as professionals, the debate in rugby concerned broken time payments, i.e. money paid in lieu of lost wages. A second, but lesser subject of debate, this time on the game itself, was that the northern clubs wanted less scrummages and more open play. Although the FA had eventually accommodated the northern clubs in soccer, the RFU was unwilling to do so in rugby. This led to 20 clubs from Yorkshire, Lancashire and Cheshire resigning from the RFU in August 1895 and forming the Northern Rugby Football Union, which subsequently became known as the Rugby Football League from 1922. The Northern Union gradually made a number of changes to their game, including: the abolition of the lineout in 1897; the introduction of professionalism from 1898; the reduction to 13-a-side in 1906 when the two flankers disappeared; and the introduction of the “play the ball” in place of rucking in the same year.